Reviewing Richard Pilbrow’s Stage Lighting Design book recently brought a number of modern lighting design problems to mind. The book, produced in 1997, describes lighting designs using the early generations of moving lights. Because the kit/control systems were complex and separate from the rest of the lighting rig (not to mention a bit unreliable), the lighting designer worked with two rigs. Those early designs began with a traditional theatre rig of conventional lights and dimmers, supplemented by moving heads. Times have changed and, despite still using multiple programmers on large scale shows, life is more integrated now. If you are designing a show for your local theatre company or school, you may get the opportunity to include some moving lights in your rig. Regarded as a special luxury, the director has approved the cost in the hope of bringing a touch of the West End to their production. Hiring a few moving lights, you probably already have conventional kit which will do most of the work and may also have to use separate control systems (analogue and DMX, for example). This means that your first steps in designing with intelligent fixtures , your mind will be split. There is nothing wrong with that but keep in mind the goal is to design with ONE rig consisting of a range of instruments, some more complex than others. What do you do with luxuries? Having hung your hat on four fixtures, you are faced with how to incorporate them into your show. There may be some parts for which they have already been earmarked – disco dancing waggle effects, moonlight blue wash, whatever. Those parts of the show that the Director agreed to the extra cost for. Although obviously important, don’t forget that others might not realise that these jobs are not always compatible from a positioning point of view – you can’t get the ladders out during the show and move the heads from over stage to front of house. This is where the term “moving lights” confuses others, including our bosses. Congratulations on specifying some intelligent lighting to be used in your forthcoming production. I am sure that you have considered the additional expense and hope to be handsomely repaid by the uplift of performance from the lighting department. A word of warning. Hiring in four 250w TiddlySpots ™ will not suddenly turn your show into a Bon Jovi concert or a grand scale epic to rival the Royal Opera House. These fixtures will not bathe your entire stage in intense colour wash, spray gobos all over a 15m area or create 40 moving beams cutting through the darkened auditorium. When you tell your Lighting Designer “This is the point when I want to go all out with the lighting.”, it is unlikely that they will be able to fill your your space with myriad looks that build to a heart stopping conclusion, leaving your audience gasping for breath. Your TiddlySpots will reward you with some flexibility, dynamics and a range of effects. They will enable your small rig to change throughout the show and may create some memorable moments. Remember that getting the most out of a few moving lights is challenge even for professionals and that your Lighting Designer will need time to get to grips with the equipment. You should also make sure they read On Stage Lighting to make sure they are fully prepared for the invasion of nodding buckets into their world. With the addition some “magic” robotic lights, there is a tendency for everyone to assume that they have hired in a whole new lighting rig. In fact, you have four new light sources. Just like four extra 500w fresnels – useful but still only four of them. It’s important to manage expectations, both yours and other peoples, even before you open that flightcase. Having established that you get four new light sources, they (like all your fixtures) need to positioned in the best possible place. Lighting design is about where your light is coming from, as much as going to. Let’s look at the possibilities of four TiddlySpots for the lighting designer. Sheer brightness make moving heads a great source of colour and texture. The ability to change and animate the colour/gobos give you a range of options throughout the show. Because many small spots are narrowish, a throw distance from 3m overhead is unlikely to cover an entire stage even using the prism. The greater distance from FOH gives more coverage but colour washes from straight on look dull. How about a high side or high front/side position? This provides a degree of “modelling” (showing the form of a 3d target) while the full force of the colour/gobo is still reflected for the audience – and the director ;-). Colour and Gobo washes on the Cyc or other scenic elements also benefit from a decent throw distance, something hard to achieve in a small venue particularly with a proscenium. The top of a flat Cyc can get colour/texture from a low side position, crossing the beams up and across to the opposite corner. Just make sure that there are no entrances between cyc and fixture, the director might not want giant shadows moving across the sky. Colour in small moving spots are most often provided by dichroic filters in a wheel. Each wheel has 6 – 10 colours, most of which reside in the saturated part of the spectrum. This means that vivid reds, blues ambers and pinks are available but the wide range of pastel colours in the Lee swatch book are more illusive. Trying to match the colour temperature of your halogen conventionals and wobbly discharge kit is hard. Nice “split colour” effects are possible by setting the wheels between full colours but the choice of split is dictated by the order in which the colours are made into the wheel. The ability of a moving spot to provide a special DSC and later reposition to Juliet on the balcony is pretty useful. But don’t forget that they still light from the same position. A stark toplight spot from above DSC turns into a full frontal assault, panto style, for Juliet high USL. Or backlight for a soloist on the forestage. Our high side positions, good for the colour/gobo wash, might not work as well for repo specials. To provide a punchy keylight, the light needs to arrive at the stage all beams parallel. This would put all of our TiddlySpots on one side of the venue – possibly not so useful for other times during your show. Shafts of sunlight could be created using just two spots on one side, with the other two in reserve or filling with a contrasting colour/ water reflections etc. 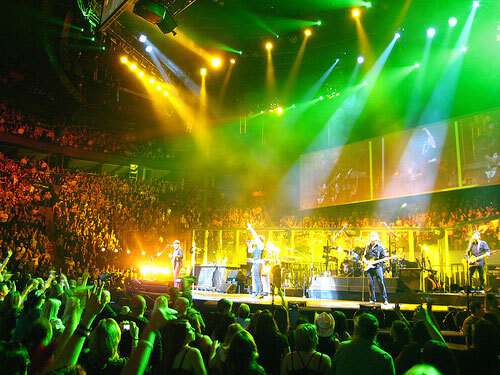 Moving rock concert style beams are great for musical numbers, provided you have some atmosphere (haze, smoke – more expense). Without this basic commodity, the effect is non-existant and your director will be disappointed. The best positions for beam structure are somewhere within the stage picture (from the audiences point of view) – over stage or just downstage of the pros. If you want the impact of blinders moving through the audience (a 250w discharge lamp in the eyeballs has a real effect on the punters) then the “shot” is best straight into their faces and must be unobstructed by the architecture of the venue. Rock style beams have the most impact in quantity, so a line of four moving spots is “bigger” than if they were scattered about the space. Two spots overhead downstage plus two on the floor is a pretty common configuration for small bands. However, the low pair will inevitably blast all over your backcloth when directed upstage for other purposes. So, where do I put my four TiddlySpots ™ then? If you have been keeping score, we have probably talked about 20 different spots in numerous positions. They can’t be everywhere. Sure they can point in different directions but the effectiveness of your goodies is dictated by where they are in your space. Inevitably, it’s a matter of compromise (no, I haven’t met your Director). Write down some jobs your fixtures have to do, then ones you would like them to do. Choose the most flexible positions for your show and venue and check your ideas will work using the most basic of scale plans and a section/elevation. Use of fixtures in each cue needs some thought. Just as you cannot get the ladder out and move the kit around between scenes, you equally can’t have four spots doing a gobo wash and then call one back for a repo special without effecting the original scene. Then the director wants the musical number to feature 20 moving beams. During the lighting plot it is easy to get carried away, stuffing every cue with different moving spot wonders, only to find it impossible to successfully move from cue to cue during a run through. With only four fixtures, your conventional lighting rig is still going to have to do much of the work while your attention is lavished on those little imposters with a digital display. Four extra light sources is not that many. Planning the position of your moving lights carefully, you can still have the great new opportunities of cheap 21st century kit. Moving lights can provide false security- the apparent ability to delay crucial design decisions until you get into venue. really nice lighitng with moving head may be do in my future !